We have 10 music reviews for you this week. We welcome a new writer this week, Shannon Courto. 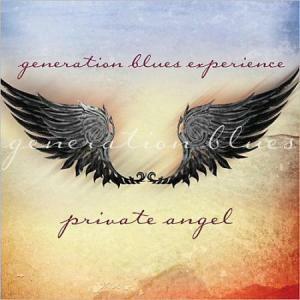 Shannon reviews a new album by Generation Blues Experience. 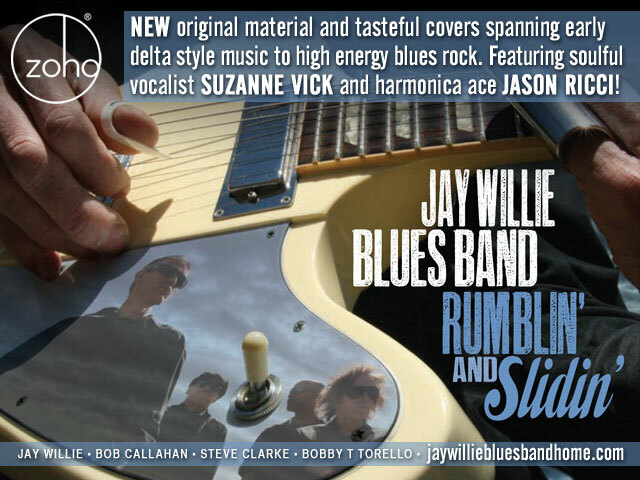 Plus we have reviews of music by Patrik Jansson Band, Jay Willie Blues Band, Planet Full of Blues, Chris Bergson Band, Dan McKinnon, Kyle Esplin, Stormcellar, Birdlegg and Carmen Grillo. Have you voted yet? 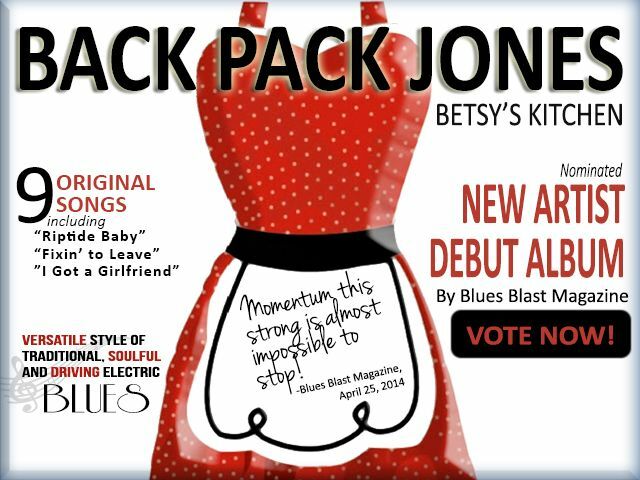 Voting in the 2014 Blues Blast Music awards continues until September 15th. If you haven’t voted yet, why not join the other 8,000 Blues lovers who have already voted? It is free and easy! To vote now CLICK HERE. 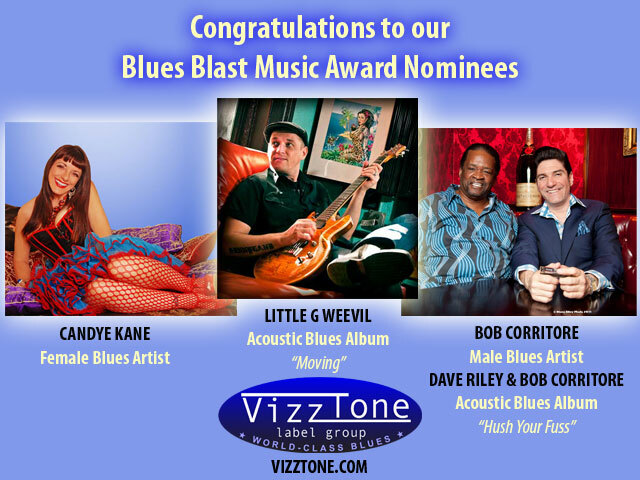 Also, we have quite a lineup for the Blues Blast Music Awards ceremonies on October 23 including performances by Albert Casiglia, Bernie Pearl and Barbara Morrison, Bobby Rush and Blinddog Smokin, Toronzo Cannon, Shaun Murphy Band, Tweed Funk, Adrianna Marie and Her Groovecutters, Back Pack Jones, Dave Riley and Bob Corritore, Brent Johnson, Annie Mack Band, RB Stone, Lisa Biales, Mark T Small, Lisa Mann, Trudy Lynn, The Frank Bey Anthony Paule Band, Steve Dawson, Rachelle Coba, Too Slim and The Tail Draggers, Sean Chambers, Josh Hoyer and Norman Taylor. Have you got your tickets yet? For tickets and compete information, CLICK HERE. 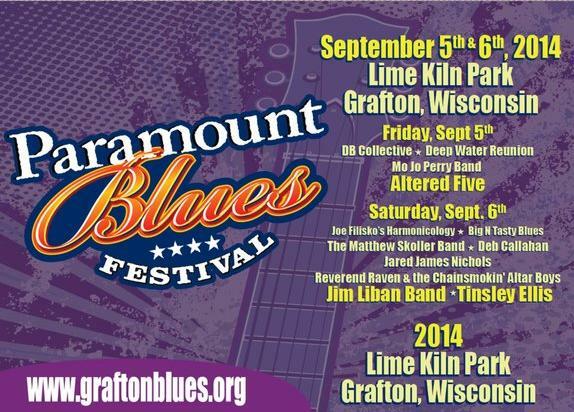 Marquette Area Blues Fest is this weekend. The festival is held right on the riverfront in Marquette, Michigan and features Jeff Daniels and The Jimmys on Friday, Fireside Blues Band, Uncle Pete’s BBQ Blues Band, Jim Suhler and Monkey Beat, Johnny Rawls and Rick Estrin & The Nightcats on Saturday and Kraig Kenning, Cannonball Drag, Ray Fuller, Lurrie Bell and Nikki Hill on Sunday. For tickets and complete info CLICK HERE or see their ad below. WOW, what a busy Blues weekend. On Friday a festival in Springfield, IL. and on Saturday another in Rockford, IL (Photos next week). 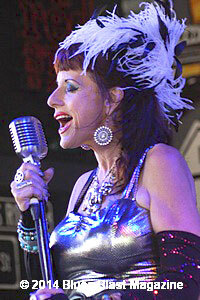 Then on Sunday back to Springfield for our first visit to the Curve Inn to see Candye Kane. Of course she was with one of my favorite guitar players, Laura Chavez! Awesome show! 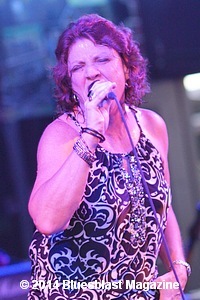 Then area favorite Hurricane Ruth took the stage for a rockin’ set! Ruth has a new album releasing next month. Founded in 2012, the band originates from Los Angeles, California. Members include Ray Goren on lead guitar; Albert Trepagnier, Jr. on drums; Tadg Galleran on bass; Lester Lands on guitar; Jamie Powell on harmonica; & Sammy Lee on lead guitar. 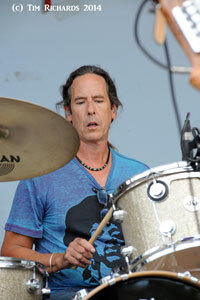 The band calls themselves “organic blues” mixed with a bit of Jimi Hendrix & Muddy Waters for good measure. Band members range in age from 14 years old to 80 years old. This wide range of generations gives them leverage for a huge plethora of knowledge, experience, as well as being on the cusp for what is new and hip. I did have some favorites on the CD. Let’s start with track 1, “Little Mama”. This tune has a funky boogie-woogie feel, solid guitar work, & is a catchy ditty that will stay roaming around in your head for days! 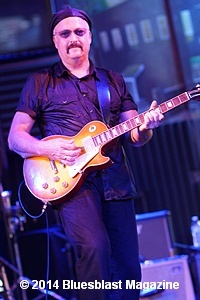 Track 3, “Crazy”, has a unique delta blues style and sound to it. I enjoyed the harmonica work and bluesy finger guitar work on this song. Song 5, “Katrina”, was also on my list of favorites. The rustic blues voice of the lead singer and captivating New Orleans sound reminded me of the old classic “Caledonia”. Track 6, “Sugar Momma” has a peaceful, slow, harmonica filled take me out to the dance floor manner. The last song that really grabbed my attention was the final cut, “Ain’t No Sunshine When She’s Gone”. This is a classic piece by Bill Withers that the band does live on the album. It is interesting to hear the audience connecting the music as well as the guitar work really getting down on this one. I always find it unique to see how the audience and band feed and interact off of each other. 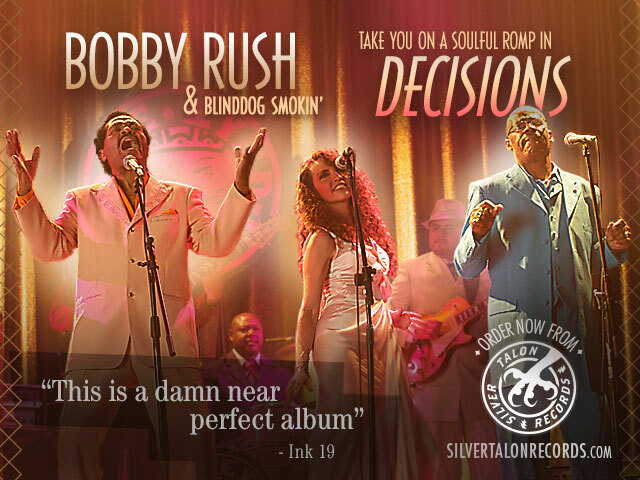 The latest release from Generation Blues Experience is sure to have you dancing in your chair. From the deep down, soul blues vocals and the excellent harmonica sounds, this CD was an enjoyable listening experience. There are also some funky horns on a few of the selections that added to the musical capability and groove of the band. Though I had never heard of the band prior to Private Angel, I will be sure to keep and ear and an eye out for their future works. Blues enthusiast since 1999. Her favorite types include delta Blues, Chicago Blues & jump/swing. She is lucky to live in St. Louis, Missouri where the music is flourishing. 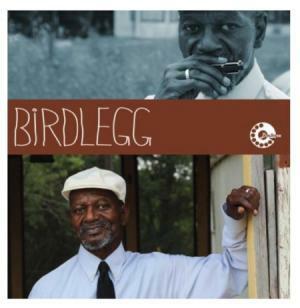 There’s only one living Mississippi-based bluesman nicknamed after a plumed aquatic bird. There’s only one living Mississippi-based bluesman that learned the ‘Bentonia-style’ of playing straight from the hands of one of the masters. 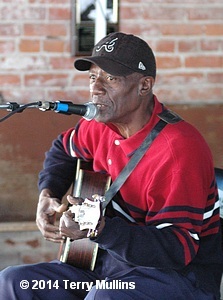 There’s only one living Mississippi-based bluesman that owns and operates the longest-running legal juke joint in the Magnolia State. 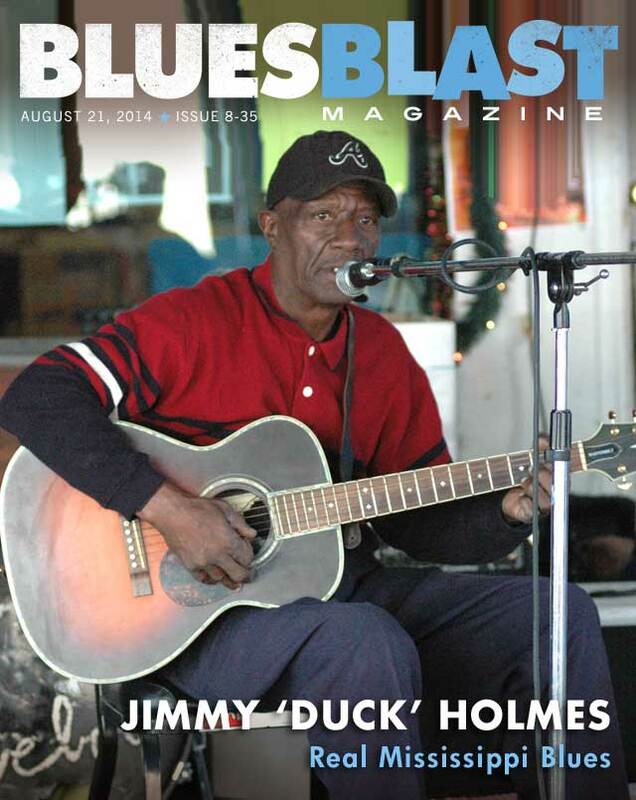 Ladies and gentlemen, meet the one-and-only Jimmy ‘Duck’ Holmes, a bluesman who is all of the above. The 67-year-old Holmes is a throwback to the days when solo, finger-picked acoustic blues player ruled the scene, long before drums, amps, electric guitars and enormous volume became standard issue for the genre. 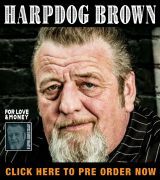 Lately, Holmes has broken away just a bit from his usual solo act to team up with the pride of Pontotoc, Mississippi – blues harp blower supreme, Terry ‘Harmonica’ Bean. Holmes and Bean took time out of their respective busy schedules to record the excellent (and appropriately-titled) Twice as Hard (Broke and Hungry Records). The Holmes/Bean combo is like a Delta shout-out to the glory days of acoustic guitar/ harp duos like Sonny and Brownie and Cephas and Wiggins – and the pairing just happened by chance. Another thing that could almost be considered a lost art in 2014 is one’s ability to operate a successful small business. But now into its seventh decade as a staple and hub of the Bentonia community, the Blue Front Café most definitely qualifies as a successful small business (a beautiful shot of the Blue Front adorns the cover of Holmes’ third CD – Gonna Get Old Someday (Fat Possum Records). The oldest business in Bentonia – holding elder statesman status over both the post office and the bank – the Blue Front and the Holmes family was honored with a Mississippi Blues Trail marker just outside the café in 2007. There just aren’t a whole lot of establishments like the Blue Front that are still up and running in Mississippi anymore. Almost as a parallel, there aren’t a whole lot of bluesmen playing the kind of acoustic country blues that Holmes is playing, either. 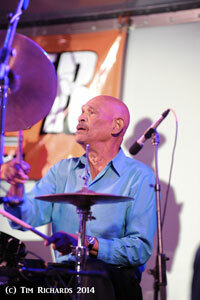 The Bentonia-style of blues first came of prominence back when Skip James was its leading proponent. Its haunting and ethereal sounds quickly set it apart from the rest of the blues-playing pack and Holmes is carrying on that tradition today. The guy that Holmes learned from was the incomparable Jack Owens, a peer of Skip James. He may not have said it in so many words, but after they began to sit on the front porch of the Blue Front and pick, it was clear that Owens wanted to pass on the Bentonia style to Holmes, insuring that the age-old form of blues would be anything but forgotten. 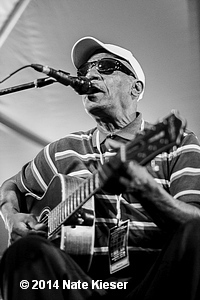 In the early going, try as he might, Owens just could not seem to get Holmes – who was ready and more than eager to grasp what he was being shown – to catch on to the intricacies of the hand-picked, Bentonia-style of blues. Even though Holmes is more than willing to be the torch-bearer for the Bentonia blues, he wants to make sure that the originators of that style of music are never forgotten. As proud as he is of the fact that he was able to learn from the hands of Jack Owens, Holmes never thought for one second that he would use that knowledge to do anything other than just sit on the front porch of the Blue Front and pick the blues. Traveling the world and playing music all over the globe was not something he could have ever imagined when he first started playing the instrument. It’s unlikely that the founding fathers of that type of blues were ever intent on crafting a new, or different, form of music. Instead, they were probably just doing what came natural to them – picking up a guitar and telling a story behind their picking. What came out is just what came out. And just how did he get the nickname ‘Duck’? Track 02: “Moving On” – Patrik Jansson and Lisa Lystam strut their stuff on this stunning post-breakup ballad. “I’ve got to get back on my feet, and see the world through different eyes. You’re like the same old record on repeat,” he sings smoothly, “and I’ve come to realize – that sometimes you’ve got to let go.” Even though this song may not be about sticking together, that’s what couples on the dance floor are bound to do once they hear it. 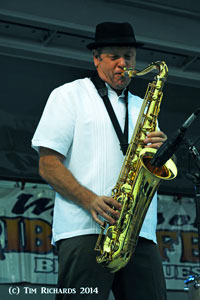 Daniel Bjurling’s sax sizzles. Track 07: “One Way Track” – This is an acerbic warning ballad for the people who never take time to stop and smell the roses: “It’s a shame the way you rush through life – every day is just another dime. Never satisfied with what you’ve got; seems like too much can never be enough. Going down a one-way track, to find out there’s no turning back. You’ll realize you might have been mistaken.” Jansson goes all out on his shredder solo. 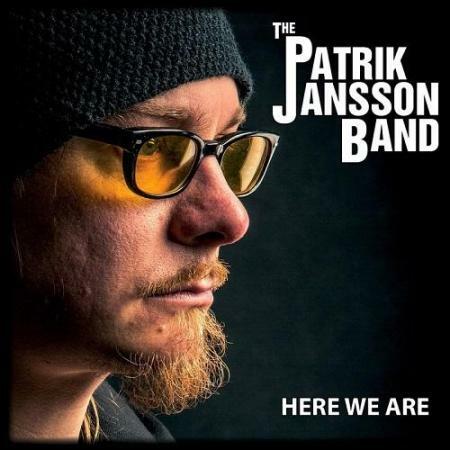 Patrik Jansson and his band call out “Here We Are”, hoping U.S. blues fans will hear them! I can’t say enough about this festival. It’s one that offers you many avenues to explore other than the high quality music. 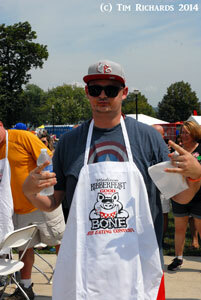 There is a Kansas City sanctioned rib cook off (with 60 teams from as far away as Florida), an amateur rib cook off and even a kids Q. After you’re done feasting on some prime pork, you can enjoy a leisurely ride on the mighty Ohio River on the Spirit of Cincinnati riverboat. If you’re more the competitive type, they have a 5K “Ribber Run” or, thanks to the Madison Area Bike Club, they have organized two bicycle rides in conjunction with the festival weekend. The first is the “Porky’s Challenge”: a 23 mile ride; or if you have a death wish, the 62 mile “Sweat Like a Pig Century Bike Ride.” Both seem a little extreme for this old guy, but they have other stuff for shall we say the wiser people. You can stroll among the painted and decorated concrete pigs known as Pigmania and vote for your favorite. Is your heart a tad stronger than that? Well how about a pig toss corn hole tournament. (don’t ask) Even the kids have their own play area with inflatable playthings in the Piglet Pen. My point is, besides the wide variety of shops in the beautifully restored downtown area, which is only a couple of blocks from the festival site, there is more to this festival than exceptional blues music. 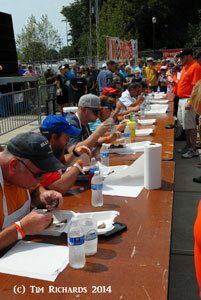 For a town with a population of only 12,000, they know how to work together to make this festival a continuing success. The weather for the weekend was beautiful, warm but not hot and lower humidity that I expected which is a good thing. The honor of starting the Friday night festivities was given to muti-talented Deanna Bogart who was returning after being at the festival in 2008. 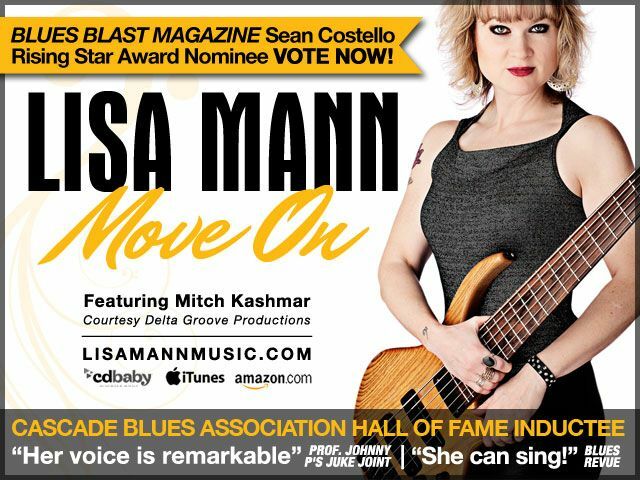 Backed by Scott Ambush on bass, Dan Leonard on guitar and Mike Aubin on drums, Deanna turned on her charm and let her fingers do the talking. Pulling a couple of songs from her newest release, she also culled a couple of covers including a funky version of Tightrope. And yes, she’s still the only girl in the band. Maintaining the level of energy was a task that Rod Piazza and the Mighty Flyers were up to. From the first note it was a take no prisoner performance. 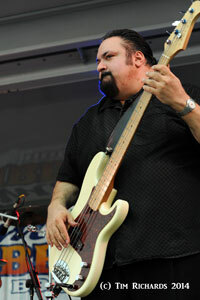 A much welcome sight to me was the addition of bass player Norm Gonzales. Since the departure of Bill Stuve, the bass line has fallen to Honey’s left hand which hindered her from doing all the great fills that I had grown to enjoy. 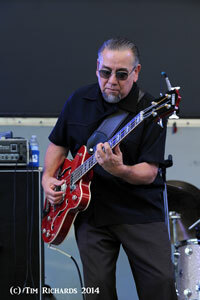 Along with Rod on vocals and harp were Henry Carvajal on guitar and vocals and David Kida on drums. There is never a dull moment with a Mighty Flyers performance and this one was no exception. Combining Itty Bitty Little One with Rockin’ Robin was a real treat. Of course Honey and David Kida did their duet which is always entertaining and Rod did his crowd walk which is always a fan pleaser. After two high speed performances, it was time to slow things down a little. The Taj Mahal Trio did just that. It was like taking a trip down the river and enjoying the slow pace of the current. 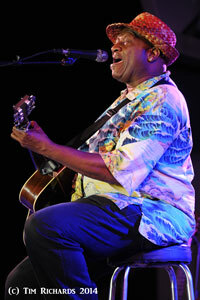 Taj treated the crowd with a laid back finger picking style that was perfect for the evening. 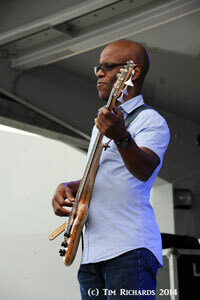 With Bill Rich on drums and Kester Smith on bass, Taj just relaxed and did what he does best. Entertain. 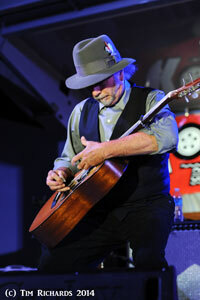 With years of songs to draw from, he wove layer upon layer of classic delta blues. The audience loved it and responded with waves of applause. With my belly full of prime pork, this was the perfect ending to the day. Chosen to kick off Saturday’s music, The Power Plant Blues Band reunited after a 20 year hiatus when a friend asked if they would play at his birthday party and the rest is history. The power trio consists of Mike Dalgleish on drums/vocals, Patter McLaughlin on guitar and vocals and Tweety Harmon on bass. Since their reunion they have concentrated on writing their own material and it’s good stuff. They still play some covers, but hey, all is good. 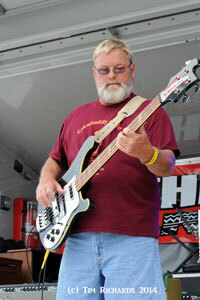 Keeping the ball rolling was the KingBees, a five piece band based in Louisville, that featured the harp and vocals of Rick Cain, with Rob Brown on keyboards/vocals, Jim Haswell on guitar and the bottom held together by drummer David Marasco and bassist Mike Taylor. 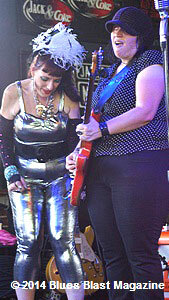 With two CD’s under their belts, they have played all the hot spots in Louisville and are an in demand party band. Playing a pleasant mix of covers and originals, the band at times had a Little Feat sound, which in my book is A-OK.
What would a rib fest be without a rib eating contest? 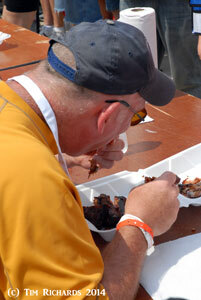 With hungry contestants ready, timers in place and judges on the watch the contests took off, the ribs had to be completely eaten, nothing left on the bone and all of it swallowed.……….and the winner is? Everybody, but the young man named Chris walked off with the trophy. 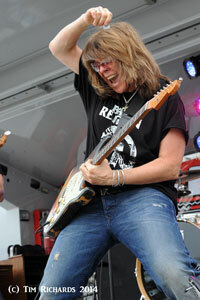 Kelly Richey never leaves a stage unless it’s in shambles. Armed with a guitar prowess and a bank of amps turned to 11, she shreds the strings until they beg for mercy. I fully expect to look out and see the crowd all with their hair standing straight out. Yes, she’s that good. Plus she has surrounded herself with two of the finest players around. Freekbass on (of course) bass and Big Bamn on drums. I don’t want to give you the wrong impression. In case you’ve never seen Kelly, she is more than just screaming a guitar; she has a gift for playing and her vocals are nothing short of raw power. Together, that adds up to one powerful performance. Going in a totally different direction was Paul Thorn. A pleasant mix of Jackson Browne and James Taylor plus his own vast talent, Thorn captivated the audience with his skilled songwriting, wry sense of humor and the honed musicianship of both himself and his band of twenty years. Weaving tales of pimps and preachers, life on the road and boxing, Thorn didn’t miss a step with a flawless performance. Backed by Michael Graham on keyboards, Bill Hinds on guitar, Ralph Friedrichsen on bass, and Jeffery Perkins on drums, his set was over way before everybody wanted it to be, but we were all feeling good and that’s what his music is all about. 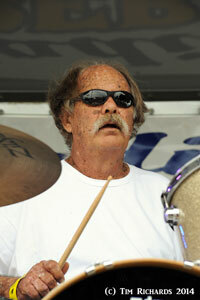 The West Coast Blues All Stars have decades of talent in the band members and it shows. Never a missed note or stumble in any song they played. Smooth as silk and plenty funky. 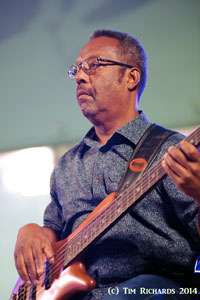 Junior Watson was at the helm with keyboardist Fred Kaplan bringing that greasy B-3 sound and they were provided with a solid platform by drummer Richard Innes and bassist Kedar Roy and it was all topped off by saxophonist Troy Jennings. Whether it was west coast jump or down and dirty blues, it was all good. Well, sadly all good things must come to an end and all I can do now is start planning for next year. I can’t say it enough: this is without a doubt one of the premier festivals anywhere. 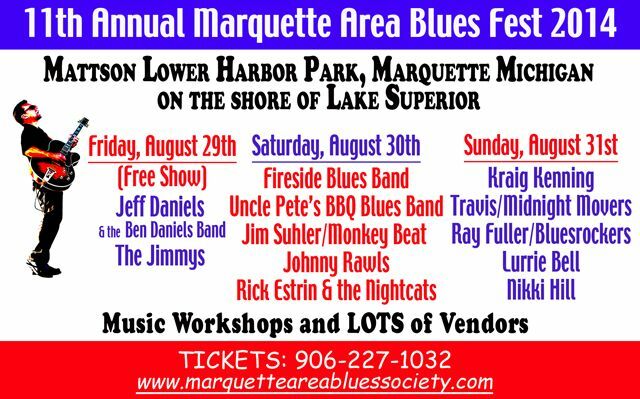 You just can’t go wrong when you combine great people with outstanding music and BBQ plus two days of quality music for $20.00. No, not $20.00 a day; for both days AND if you order your tickets before August 1, they will throw in $10.00 worth of food tickets. What are you waiting for? Start planning now for next year. Why do many, if not most, blues artists like covers? 1) They enjoy paying homage to the founders of their favorite genre; 2) Some fans consider only the songs and styles of the old masters to be real blues; 3) Playing covers is easier than composing new material; 4) No one can mistake them as being from another musical category, and 5) They’re perfectly suited for live shows. What die-hard blues crowd can’t sing along with such classics as Sonny Thompson‘s “Tore Down” and Muddy Waters’ “Key to the Highway”? Both of these are included on Connecticut native Jay Willie’s latest release, “Rumblin’ and Slidin’”, which might almost be called a tribute album. Out of the fourteen tracks on it, eight are good covers, but Willie’s own selections are better. Track 04: “Bad News” – This frenetic blues boogie by Bob Callahan has one of the catchiest chorus hooks – and saxophone solos – of the summer. “You took all my money, stole my fancy car, got my friends to hate me, and that ain’t all so far…How do you think I feel, how do you think I feel, how do you think I feel about you?” ‘Hateful’ is an answer, but not the right one. Track 05: “Rotten Person” – Another rocking rendition about mixed feelings regarding love, tune five is hilarious: “You’re a rotten person, and you deserve desertion, and I really hope you end up alone…You’re so cold, you’re so mean, make me want to scream, and all I ever talk to is your answering machine.” Jay Willie’s slide guitar is as wicked as the subject of this song. Track 08: “The Leetch” – The spelling of this ballad’s title blood-sucker is a snicker-inducing cross between a black, squirming ’vampire’ and a slur unfit to print in this e-zine. However, our protagonist’s present parasite prefers alcohol instead of blood: “Can’t barely sleep no more. Always hanging round my door. What are you looking for?…a ride to the liquor store.” The Highlights here are the jittery electric-guitar refrain and Jason Ricci’s howling harp. “We are not your typical Snooze Blues band, nor do we want to be. 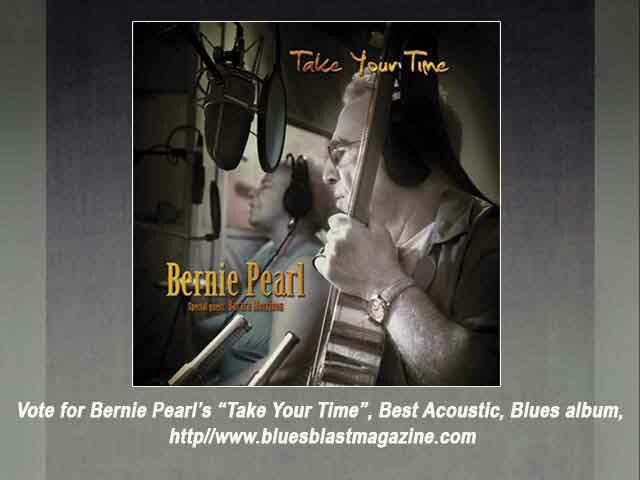 If you like blues that is repetitious and holds on to one guitar note for 10 seconds, this record may not be for you,” says this album’s press release. 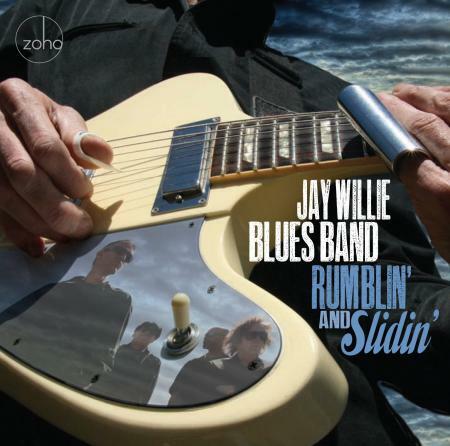 Rumblin’ and Slidin’ sure is a hit for blues rock lovers! Back in the 1950s and ‘60s, most songs (of any genre, but especially rock) were short, with few of them clocking in at over four minutes. As time went on, track length increased, most notably in the blues. Today it’s not uncommon to hear jam songs of ten minutes or more, making live throngs go wild but radio stations go crazy trying to decide when to ‘fade out’. 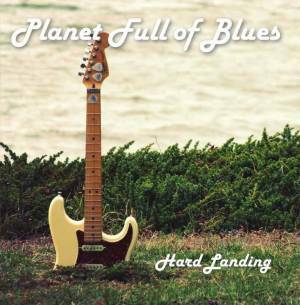 Planet Full of Blues, on their rollicking sophomore album “Hard Landing,” hearkens to the ‘good old days’ when tunes were like popcorn chicken, packing a ton of musical flavor into bite-sized portions for the ears. Track 03: “Mashed Potatoes and Gravy” – This gritty shuffle will make fans ravenous for it to be longer. It vanishes down one’s aural gullet after only two minutes and fifty-four seconds. Our hungry hero has been promised several delicious entrées by his lover, none of which are to be found. “I’m warning you; I ain’t your fool. Don’t go messing with this big man’s food,” Light sulks. 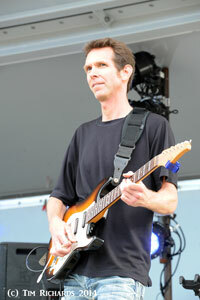 His electric-guitar fretwork is the hot sauce on top of everything, spicy and satisfying. Track 05: “Busboy” – Sneeringly talk-sung by Brock Howe, this is a ballad of a bottom-of-the-barrel bloke at a fancy restaurant. One day he’s called on the carpet by his employers: “They said I didn’t smile as much as I should. I’m just a busboy with an attitude problem.” Such low-wage, low-prestige work isn’t likely to engender grins anytime soon, so the peevish narrator quits and uses the money he’s already earned to fuel big rock-star dreams. Is this tune biographical? It might be to college grads crushed by student loan debt. Track 06: “I Had a Dream” – Slow-burners are perennial blues favorites, as number six will surely be once the world hears it. Johnny Ray Light embodies an insomniac who fails to find relief: “I hope sleep don’t come to these empty arms. If it does I’ll surely feel the same old voices that I always hear – repeating lines that I can’t erase. Tears and shadows and grieving face.” With poignant vocals reminiscent of Joe Louis Walker’s, “I Had a Dream” is a vision come true. Hard Landing is no bumpy airplane ride for those who crave blues rock, especially as mastered by Planet Full of Blues and Jim Gaines! It is not hard to find a great blues or rock guitarist, and tracking down a good singer and front man is a little harder, but they are out there. Songwriting clinics crank out more than enough new writers every week, and some of them can actually pen really nice tunes. But, finding a talented guitarist that is also an effective leader, singer, and songwriter is not an easy task, which makes Chris Bergson a true find! Bergson is a New York City native who has lived in the tri-state area for his whole life, and who has been recording his music for the past 20 years. Chris’ playing has deep roots, and he is more than proficient in all genres of music, and he is even a faculty member of NYC’s 92Y (serving the community for 140 years), teaching jazz, rock and blues guitar. 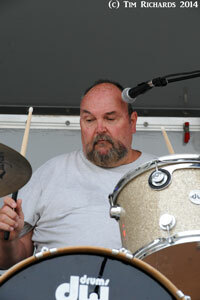 He has worked and played with the big names in the business, including B.B. King, Etta James, Norah Jones, The Band’s Levon Helm, and Howlin’ Wolf’s guitarist, Hubert Sumlin. 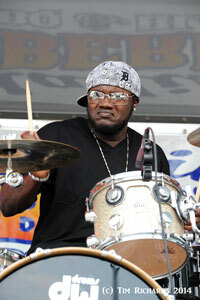 He has recorded six studio albums, including the award-winning Fall Changes and Imitate the Sun. This time around the Chris Bergson Band gives up a dose of their stage show with Live at Jazz Standard. This New York City club has been his home base for the past 10 years, and he drew these 15 tracks from two shows last summer. 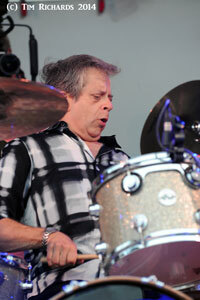 His usual four-piece group was up front, including Chris on vocals and guitars, Craig Dreyer on keys, Matt Clohesy on bass and Tony Leone behind the drum kit. They were joined on these gigs by the fine horn section of Ian Hendrickson-Smith and David Luther on sax, and Grammy winner Freddie Hendrix on trumpet. Roman Klun recorded and mixed this CD, and acted as co-producer with Bergson. The first track on the disc is “Greyhound Station” and the band opens strong. Even though the club is called Jazz Standard and Chris was appointed the U.S. Jazz Ambassador by the Kennedy Center, this show is nothing but killer funky blues. After the guitar-heavy intro Bergson launches into the vocals and he belts them out convincingly with harmonies courtesy of Tony Leone. 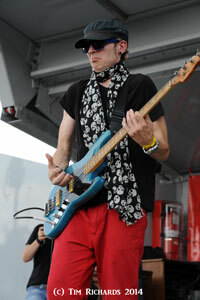 Chris also tears out a hard-hitting solo and lead licks throughout. This is one of the seven songs he co-wrote with his wife, Kate Ross – in fact this album was mostly written by Bergson, with eight all-new songs, and five older tunes that have been extensively remodeled. After the horn-heavy “Mr. Jackson” (with horn arrangements by Jay Collins) the band is joined by special guest vocalist Ellis Hooks for “The Only One.” Hooks’ glorious voice pairs well with Bergson’s, and there is a Sam and Dave good times vibe at work here. The backline of Clohesy and Leone is spot-on but never goes over the top as this show is all about the songs, and the musicians are there to help tell the story, not to show off. The two non-originals on Live at Jazz Standard are the harmony-heavy traditional “Corinna” and Ronnie Shannon’s “Baby, I Love You.” The latter is an instrumental that allows Bergson to spit out sharp lead licks on his guitar over the punctuation provided by the ultra tight horn section. The vocals leading up to this point were so compelling that the musicians were appropriately playing a supporting role, and it is nice to hear the band cut loose a little! The heavy funk of “Christmas in Bethlehem, PA” makes sure that this is nothing like any holiday song you have heard before. Dreyer’s 1970s organ sound, Bergson’s processed guitar and Leone’s massive snare set the stage for Hendrix, who channels his inner Maynard Ferguson. The lyrics are full of hard luck and longing, and Chris sings them with all of his heart. The final two cuts on the album are “The Bungler” and “Gowanus Heights,” both Bergson/Ross songs from his acclaimed breakthrough album from 2008, Fall Changes. Listening to these cuts is a reminder of what a well recorded, mixed and mastered album this is. The sound is clear, no instrument or voice seems too loud or soft, and there is a logical progression to the songs with natural sounding breaks in between. Kudos go out to Klun for his recording and mixing, and to Chris Gehringer for his mastering work – professionals like these guys make all the difference in the world. 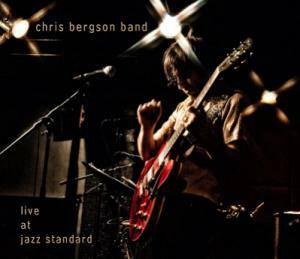 Live at Jazz Standard is a fine piece of work from Chris Bergson, providing a realistic overview of his career to date, and it is much more relevant than any “Best Of” or “Greatest Hits” album could be. Most artists would be content to rehash old stuff, but the Chris Bergson Band stepped up and provided more than enough new material for their old fans to enjoy. For those who were not fans before, this disc will convert them into believers and it may convince them to seek out his catalogue and maybe even inspire them to catch a live show the next time they are in New York City! 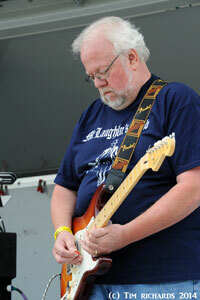 Toronto based guitar slinger Dan McKinnon is well versed in blues and rock. 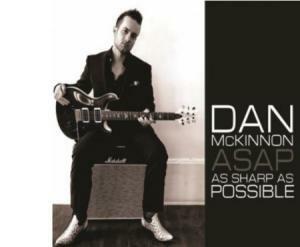 Featuring a power trio with McKinnon on guitar and vocals, Aaron Carter on bass and Jon Foster on drums, all ten songs are originals by McKinnon on his inaugural CD. This thirty-something musician is a hot commodity on the local music scene in Ontario and has a great 1970’s sort of blues rock sound going for him. “Ain’t Looking Back” opens the CD with a driving guitar and breathy vocals. McKinnon claims he’s not looking back in his goodbye to his ex-love; he offers up the first of his massive guitar solos and he does deliver the goods here with nice tone, feeling and some air between the notes. “King of the Hill” could be a song from a band like Mountain. It has a similar big and dirty sound to the guitar. Vocally, McKinnon has a fairly high register and delivers his lyrics well. Another nice solo is performed on the ax here, too. On Lucky One” the tempo drops a bit as McKinnon sings more soulfully and expressively to match the tone of the song. 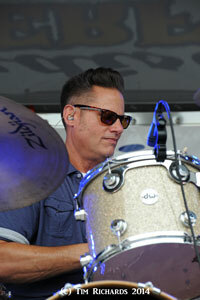 He returns to the big, driving beat on “Got It Bad,” reminiscent of perhaps a Kenny Wayne Shepherd or Johnny Lang here. He goes to the slow blues on “Killing Time;” the guitar crys out and speaks to us sweetly on the intro. His delivery here is again filled with soul as he states he’s “done killing time” with this ending relationship that he sings about. A nice and poignant guitar solo is also offered up in this. “Heart Attack” takes the beat and heat back up as Foster lays out a fast beat and then McKinnon joins in with another big guitar lead. Amusingly, he uses the idea of a heart attack to express the intensity of his love for his woman. “Perfect Ten” might be a Buddy Guy song; the guitar licks and sound to open up the cut really reminded me of Buddy. He sings of his woman who is a perfect 10 and stays with the positive relationship stuff from “Heart Attack.” “Recipe” is a slick instrumental with a great little groove to it. He returns to the roots and passion of deep blues with “One Regret.” Super vocals and a nicely picked guitar solo are the big features here. He closes with the jumping and jiving beat of “A Different Road” as his guitar wails while Carter and Foster along with McKinnon whip things up into a frenzied state. 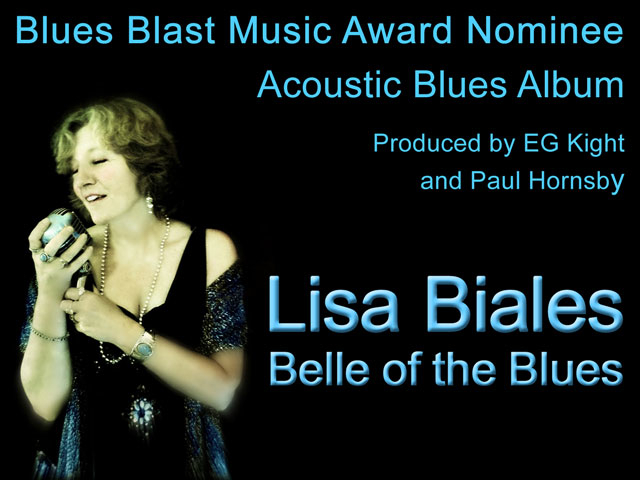 As Sharp As Possible was named the 2013 Canadian Blues Debut Album of the Year and third best Blues/Rock album of the year by the Blues Underground Network. I can see why given the great set of songs and performances by McKinnon and his mates. 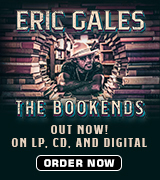 If you like your blues rocking, you will certainly find something you like on this gentleman’s debut album! Scottish born piano wiz Kyle Esplin presents an international affair with this CD. Two band members are from Palma de Mallorca, Spain, one from Argentina while the recording was done in Germany under producer Rolf Bresser. The music represents Kyle’s love of fifty’s and sixties piano-based rock and roll with a bit of New Orleans and country music thrown in for good measure. His piano playing owes a lot to the raucous style of “The Killer”, Jerry Lee Lewis. His “white bread” voice works the best on the smoother tunes as it lacks the necessary grit for the more rougher songs. The speed and technicality of his piano playing will make your jaw drop at times. 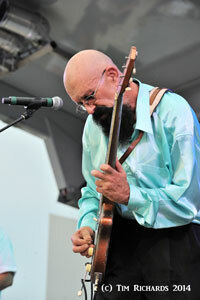 His band is with him at every turn and guitarist Balta Bordoy provides excellent blues-tinged playing. Right from the git-go the piano jumps at you as it is mixed high. The lead-off track “Drinkin’ Wine Spo-Dee-O-Dee” sets the tone for most of what is to come. His voice fits this tune to a “T”. The Jerry Lee Lewis piano-style is put to good use on this song. 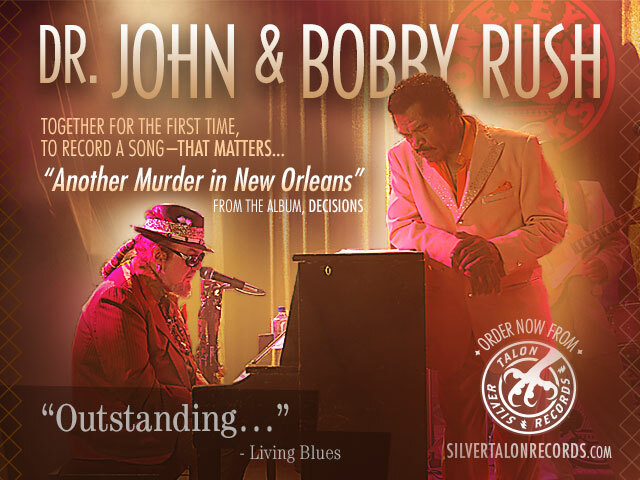 “Mean Cheatin’ Woman”, attributed to Dr. John, features some nice boogie-woogie meets New Orleans piano playing sounding way cool. Super human “speed-freak” piano playing is on display on “Mess Around”, a tune associated with both Ray Charles and Dr. John. How does he do that? Pretty amazing stuff. Huey “Piano” Smith’s “High Blood Pressure” brings more piano fire, but his vocal sounds like a Las Vegas “lounge lizard”…”Hi, I’m Johnny Venture, good to be here”. The seemingly fake exuberance here and on a few others mars the performance. The most puzzling song here is “Show Business”. I’m not sure if it is intended as a parody as it comes off as being a bit corny. Piano glissandos fly all over the place but the guitar playing is “spot on” as it is on the entire record. “Stag O’ Lee” and “Folsom Prison Blues” are worthy versions. Kenny Rogers And The First Edition’s “Just Dropped In(To See What Condition Was In) is a choice from “left field”. It starts out with a bluesy piano intro and amazingly listen after listen it actually starts to work, although it brings the listener back to the lounge. The final three songs bring the Jerry Lee Lewis influence to the forefront- “High School Confidential”, “Great Balls Of Fire” and “Whole Lotta Shakin'”. 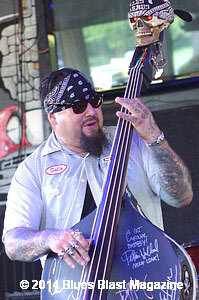 The first features some period correct “slap-bass”. On the next Kyle actually manages to bring a bit a roughness into his voice. 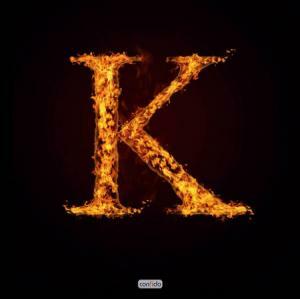 Although the piano pyrotechnics are intact on the last tune, the vocal reverts back to sounding like a Vegas act. 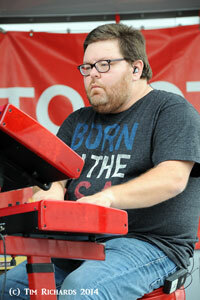 The picture isn’t perfect here, but there is no denying that this guy is a piano freak of nature and a self taught one. 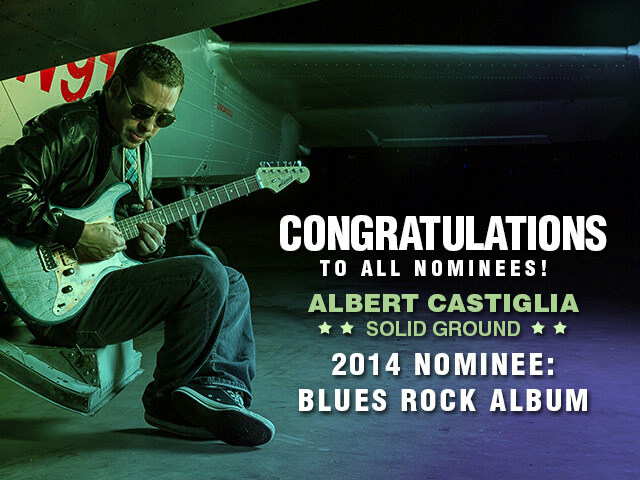 Guitarist Balta Bordoy, drummer Jose-Luis Garcia and bass player Pablo di Salvo aren’t far behind. It would be nice to see what Kyle could do with some original material suited to his voice. But man can that guy burn up the “eighty-eights”. 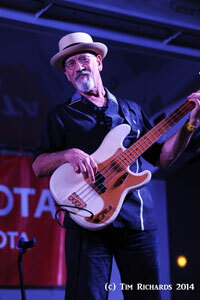 Stormcellar opened the fifth annual Crossroads Blues Festival at Lyran Park in Rockford, Illinois on August 23rd and they have just released a brand new blues and roots CD to kick off their second US tour. Hailing from Sydney, Australia, these guys are superb musicians with a great roots sound! Featuring Michael Barry on harp and vocals, Paul Read and Michael Rosenthal on guitars, Theo Wanders on drums and the revolving deputy bass section, this is a band that keeps getting tighter and tighter in their musical approach. The CD opens to “On The Low Low,” a song with a distinctive attitude. A driving but moderately slow blues that talks about what we do on our own time is only our own business. The tune grinds to the beat and Barry’s harp bleats out in guttural fashion. “Slipping Through These Blues” is what I’d call a somewhat ethereal TV theme song sort of blues. It’s got that smooth sound that chic TV show theme sorts have with a little mean slide guitar and some reggae laid over it. Very cool and very interesting, and then Barry comes in for a harp solo that is like a robust version of “Once Upon a Time In the West” and that haunting Enrico Moriconi sound. I loved it. Mandolin time comes next with “Queen Above The Oceans.” A short and effective folky tune, it has some pretty mandolin and accordion on top of the fiddle and acoustic guitar. The boys go to the country with guest Jo Fitzgerald adding her vocals harmonies to Mike’s lead on “Put On Your Sunhat Sweet Adeline.” Sweet finger picking and harp work make this a song that you might hear on a Delta or Australian front porch. 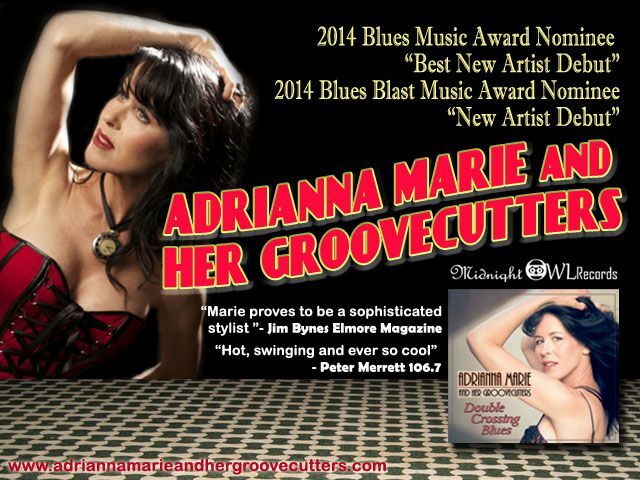 “Dirty Work” brings us to a repackaging of a Steely Dan song into a driving blues rock. Using Fagan and Beckers lyrics, the boys add their own music and it really is pretty nicely done. The guitar blazes and the vocals are strident here. 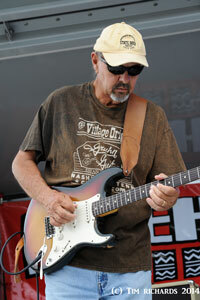 “Downward Bound” offers up some traditional, dirty, low down driving blues licks. The harp and guitar are sweet as Barry guts out the vocals and deliver s great song that moves along and gets you wanting to dance. In “Cry For You” the band gives us a short, folky number with a stark approach. The acoustic guitar and vocals stand alone and the ballad is offered up quite effectively for our consumption. They follow the stark ballad with a bit more robust ballad called “Twice Shy Girl” which breaks out into a rocking number after about a 90 seconds and then they revert for the end to the more subdued approach. Interesting and cool! “Travelling Song” features mandolin and has a country twang with vocals and harp. The boys tried t get a live sound in the studio and I think they achieved that quite well. “Give Me Something I Want” is a very bluesy cut where the central theme is, “If you can’t give me something I want, give me something I need.” I don’t think that need much explanation. Stinging guitar work here that blends with the harp, nicely done! I liked this CD a lot. It’s cool, slick and fun. It’s not completely blues, adding folk and country to the mix to make a unique and eclectic sound. 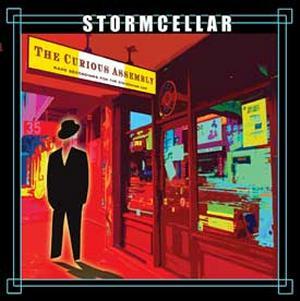 Stormcellar will intrigue the listener with an ear for good music while giving something for fans of many genres to appreciate in one very well done package. 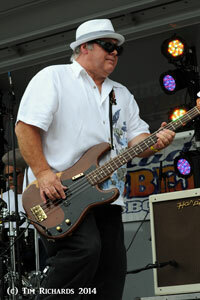 Gene Pittman, AKA Birdlegg, is a Pennsylvania native that now resides in Austin, Texas. 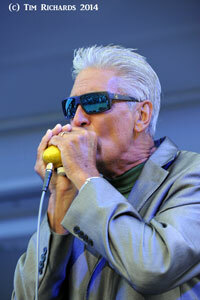 This 66 year old harp player plays an in a more blues early harp style (i.e. 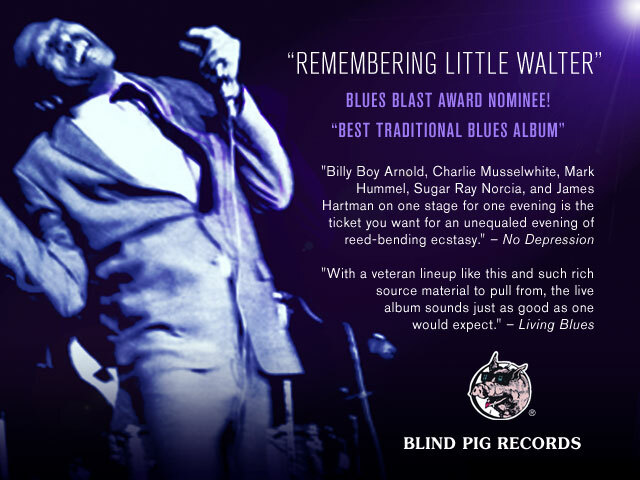 pre-Little Walter); he learned to love the blues from his grand father who played National Steel Guitar and toured nationally. He picked up a harp in his twenties and began to memorize every Sonny Terry lick he could listen to. 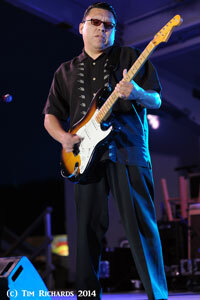 He moved west, was a fixture in Oakland and the Bay Area blues scenes and released his first album there in 1990. He gave up on that after 35 years and moved to Austin. He’s a cool cat and can sing and play with anyone. The band on this is a very talented Austin group, including Omar Dykes and Mike Keller on guitar, Kaz Kaznoff on sax, Nick Connolly on keys, Johnny Bradley on upright bass and Jason Moeller on drums. Recorded live in the studio, Pittman gives us 8 originals and 4 thoughtful covers on this well done album. The covers are “Fanny Mae”, “I’ll Play the Blues For You,” “747” and “You Set Up My Mind.” Pittman’s harp opens “Fanny Mae” in an unadorned and stark fashion. It’s a good cover and nice hook for the CD. 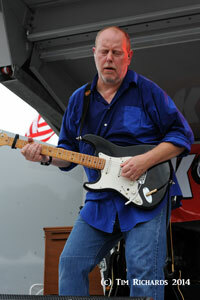 Keller does the guitar work on “I’ll Play the Blues” and supports Pittman well; the vocals are soulful and convincing. “747” swings na jives with Birdlegg and Keller really doing a fine job. The final cover is a beautiful Jimmy Reed song. The simplicity of the harp sound is very cool; no over-amplification here, just raw emotion. The originals hearken back to the old days. “San Pablo” has a Bo Diddley beat and is a fun cut with a great lyrical set of lines and nice harp and sax work. 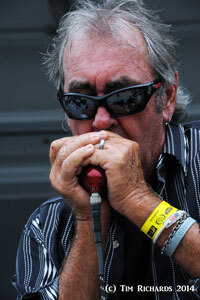 “Draw In Your Lip” offers up more classic sounds and a nice organ line. A soulful harp intro on “Restraining Order Blues ” sets the tone for some beautiful slow blues. “BLB” is a slick little instrumental. 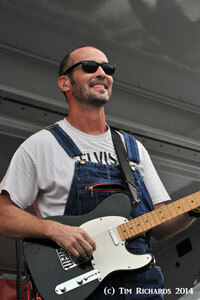 He closes with a down home tune “Down In My Shoes,” which is very authentic Delta blues. He blows some more mean harp. The other cuts are equally good and a lot of fun. Keller is great on guitar throughout as is Dykes on his five cuts. Kazanoff is stellar on sax, too. But Birdlegg is the star here. He’s not showy or trying to overly impress the listener but he delivers a very soul-filled performance on harp and vocals. I enjoyed this a lot and I think anyone with an appreciation for traditional blues will too! 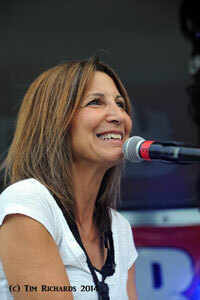 Carmen Grillo has been an in-demand session player on the West Coast for many years. 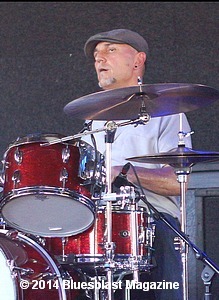 He was a member of Tower Of Power for a decade and currently plays in The Sons Of Champlin, as well as running his own studio, writing and playing a wide variety of sessions. 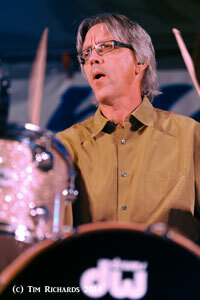 On this album he makes good use of his contacts with appearances by the Tower Of Power horns and many well-known West Coast players. Carmen plays all the guitar parts and handles lead vocals, assisted by Tony Braunagel, Steve Stephens and Herman Matthews on drums; Mark Meadows, Bobby Watson and Francis Rocco Prestia on bass; Mike Finnigan, Bill Champlin, Rob Mullins, Mark Hugenberger, Dale Ockerman, Bob Emmet and Ruben Valtierra on keys, Curt Campbell on harmonica and Greg Adams, Stephen ‘Doc’ Kupka, Lee Thornburg, Dave Boruff, Johnnie Bamont, Tom Saviano and Tom Scott on horns. Carmen wrote most of the material, assisted by various co-writers but the album opens with two covers. “Come And Gone” comes from the pen of Greg Koch and makes for a great start as Carmen’s fluent guitar and the massed horns drive the song along, Carmen immediately demonstrating that he has a good voice. The horns are again influential on a funky version of Johnny ‘Guitar’ Watson’s classic “A Real Mother For Ya” in which Carmen produces a very fine, sinuous solo. 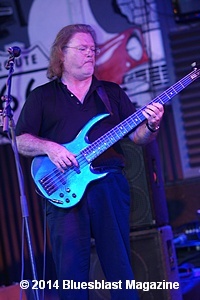 There is a different side to his playing demonstrated on the instrumental “I Got The Sauce”; the bubbling bass (by co-writer Francis Rocco Prestia) starts it off, with the keys providing the rhythm parts over which Carmen plays in a soaring style that recalls jazz-rock players like Lee Rittenour – not at all blues, but great to hear anyway. “Tryin’ To Make It Happen” has the horns back in place on a mid-paced tune with a very West Coast, laid-back feel before another instrumental “Prototype”, featuring sax ace Tom Scott whose reed parts sound like more than one person is playing, Carmen responding to the challenge with some fine playing, again in jazz-rock mode. The title track “A Different World” puts the horns alongside a funky riff as Carmen gets a little political: “The world we live in ain’t like it used to be, won’t find a solution in Washington DC. Pure and simple, it might never be the same. Don’t be discouraged, it’s the nature of the game”. More funk follows with the catchy “Transatlantic Boogie” as Carmen creates a dialogue between two guitar parts and the rhythm section gets deep into the funk while piano man Bob Emmet plays off the rhythm to set a counterpoint to Carmen’s guitar. “Sad State Of Affairs” is a ballad with more blues content than on most of this album, the ‘b’ word even putting in an appearance: “People are always crying the blues, when nothing’s right and there’s nothing left to lose”. “The Nature Of The Beast” is an uptempo tune co-written with harp player Curt Campbell, Carmen producing a great riff upon which Curt and the horns show us their strengths. 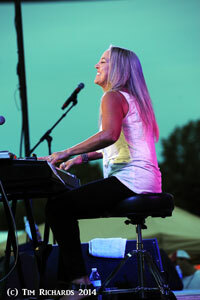 “Everything’s Gonna Be Alright” is definitely a blues with the rolling rhythm and Carmen’s convincing vocal supported by twin keyboards that give a real swirling feel to the tune. A final instrumental “River Of Molten Rock” gives Carmen the chance to solo fluently over some strong drumming, percolating bass and organ. The closing track is different, with Carmen on acoustic guitar accompanied only by Rob Mullins’ keyboard, a touching ballad paying tribute to a strong relationship in “You’re The One”. 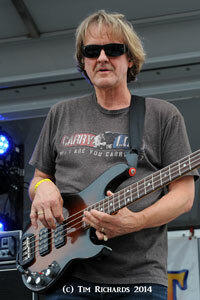 A strong track vocally, Carmen harmonizes with himself, producing a sound not unlike CSN on the chorus. Whilst there is not a lot of blues content in this album the material is strong and the quality of playing excellent. 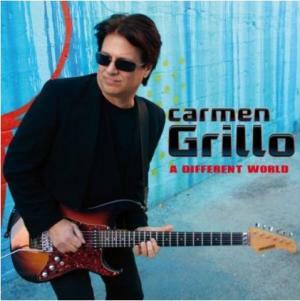 With a mix of influences ranging across jazz, pop, rock and R n’ B Carmen Grillo has produced an album that has something for most listeners to enjoy. Santa Barbara Blues Society Presents An All-Star Benefit! The oldest existing U.S. blues society (founded March 1977), the Santa Barbara Blues Society (SBBS) will present a gala all-star party at the Carrillo Recreation Center, 100 E. Carrillo St., at 8 PM on Saturday, September 6. Anchored by the lauded Ventura band Hot Roux, the show will feature the appearance of some of Santa Barbara’s (and the nation’s!) favorite blues artists in a benefit for the SBBS. 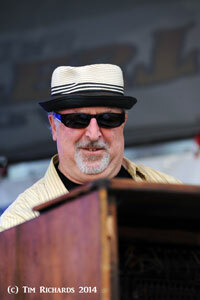 Scheduled to perform are: Kim Wilson, who was known as Goleta Slim when growing up in the S.B. 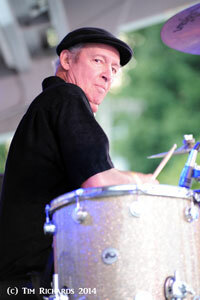 area, and who has attained international acclaim since founding The Fabulous Thunderbirds. 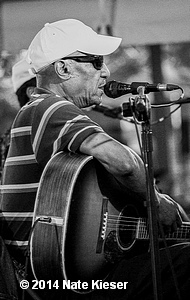 He has won countless awards for his harmonica playing and showmanship; Roach and Byl, founders and mainstays of Café R&B, one of S.B.’s all-time favorite bands (and now S.B. residents! 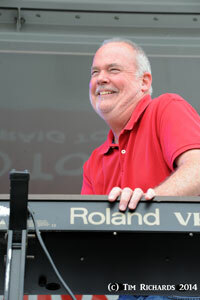 ); James Harman, highly praised singer, song writer, and harmonica player, winner of two coveted Blues Music Awards this year from the Blues Foundation, Carl Sonny Leyland, generally acknowledged to be one of the best rockabilly and boogie woogie pianists on the planet plus surprise guests. Doors open at 7 PM, music starts at 8 PM. There will be free BBQ snacks and a large dance floor. Call (805) 722-8155 or go to www.SBBlues.org for further information. The free 26th Annual DC Blues Festival is Saturday, August 30, 2014 from noon-7:30 pm with internationally acclaimed headliner Shakura S’Aida. The festival venue is the Carter Barron Amphitheatre, located at 16th Street and Colorado Avenue NW, Washington DC 20011. Bring the family for a day of soulful and electrifying blues, music workshops, Musical Instrument Petting Zoo and other child-friendly activities. No tickets are required. 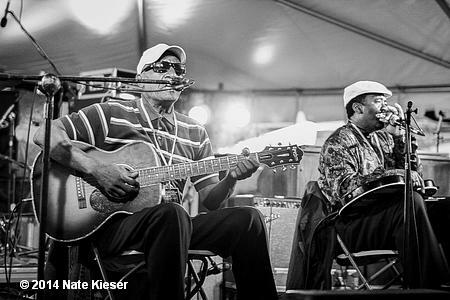 The Natchel’ Blues Network and Beach Events presents The 21st Annual Blues at the Beach Festival September 5 & 6, 2014 at 17th Street Stage – Virginia Beach VA. 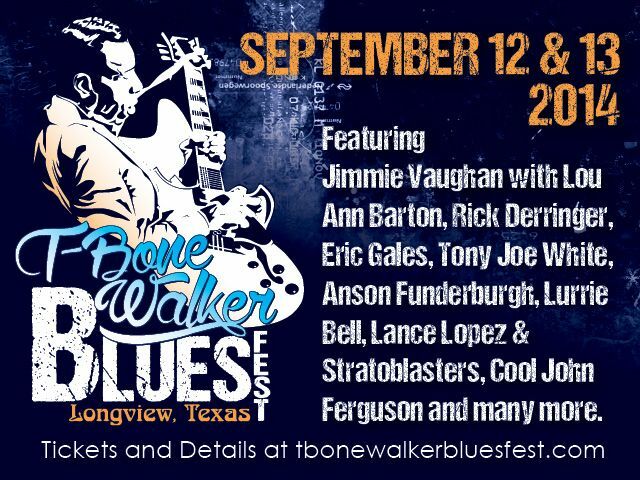 Lineup includes Jarekus Singleton and Lil Ed & The Blues Imperials on Friday and Doug Deming & Dennis Gruenling w/ The Jewel Tones, Dirt Cheap Blues Exchange Dance Workshop, Damon Fowler Group, Bernard Allison and Tommy Castro & The Painkillers on Saturday. 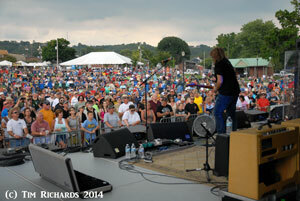 2014 Friends of the Blues Concert Series – All shows held in Kankakee, IL unless otherwise noted.